The Los Angeles (Cal.) 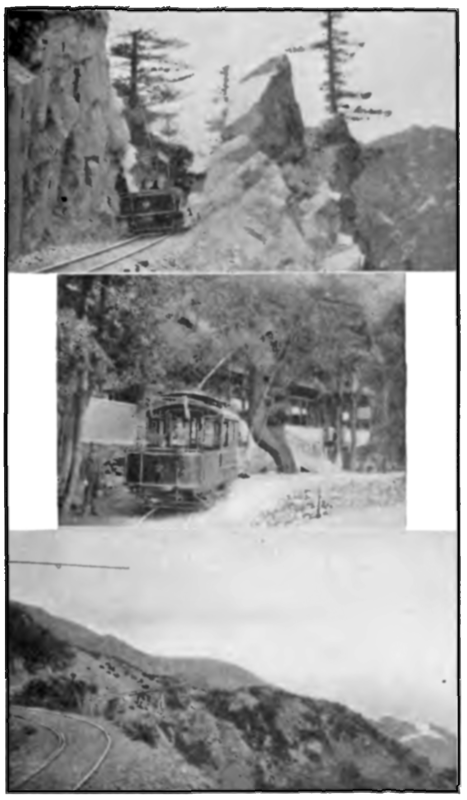 & Pasadena Electric Railway Co. owns a number of interesting cars, several of which we are able to show herewith through the courtesy of Mr. W. H. Smith, manager. Figs. 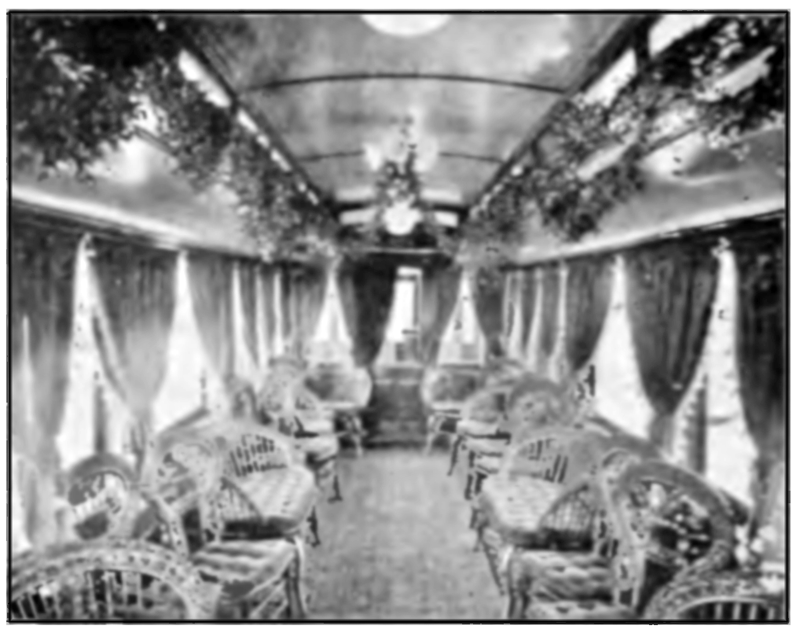 1 and 2 are exterior and interior views of a parlor car rebuilt from a standard coach. It has wide observation platforms, a feature that adds greatly to its value as a pleasure car. The interior furnishings include complete buffet, with china closet, icebox and running water, electric stove and heater, and portable dining and card tables. The car is lighted with two 1,000-c.p. direct current arc lights inside and one outside, which are operated in series with the arc headlight, the resistance of the lamps being used to heat the cars at night, which is necessary the year round in California. The arc lights are the invention of the chief electrician, Mr. S. H. Anderson, and any number up to eight can be operated in series, consuming but 2½ amperes. The company is now equipping all of its cars, inside and out with this style of light, and finds them to be as economical as the small incandescent lamps and far more satisfactory to the traveling public, as they will give a perfect light, even though the voltage drops 150 volts, whereas incandescent lamps would give hardly a glow. The car is equipped with two 50-h.p. Westinghouse motors and axle-driven air brakes. Fig. 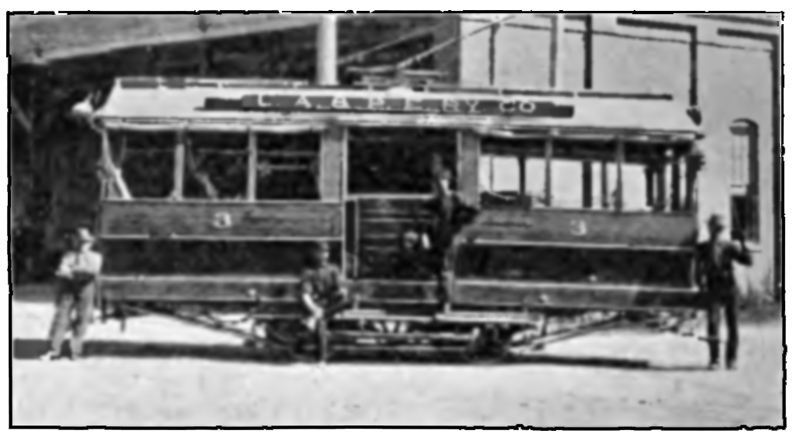 3 is the company's standard coach, 35 ft. long over all. It is equipped with two 50-h.p. motors and axle-driven air compressors for the brakes. The seating capacity is 42, but upon one occasion the car has carried in one load 174 passengers from Los Angeles to Pasadena and none were on the roof. Fig. 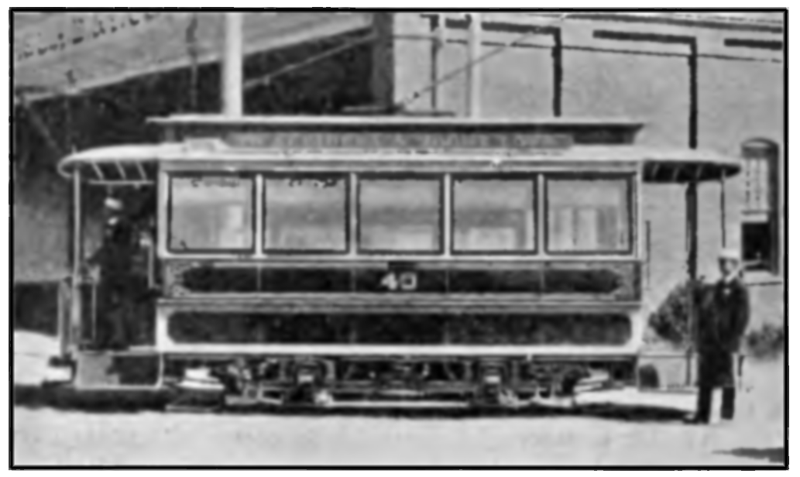 4 is one of three cars which were originally constructed by the old company to be used as trailers. They were found to be too heavy for that purpose, however, and were therefore equipped with two 50 h.p. 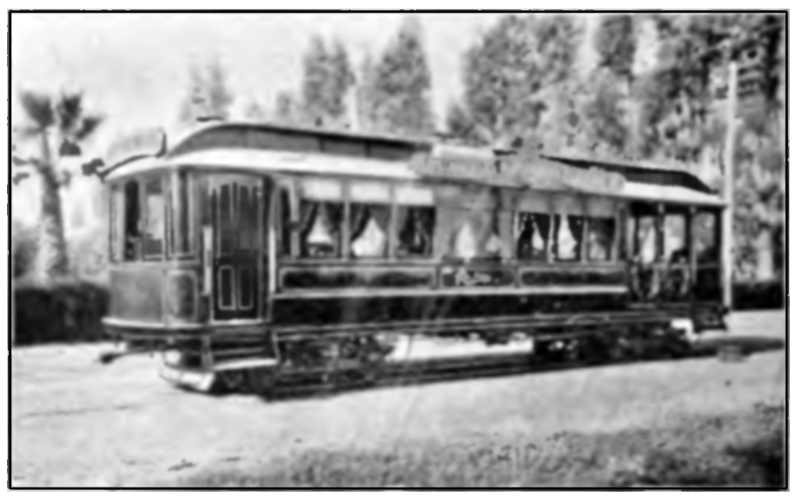 Westinghouse motors and air brakes, and are now used to pull a light but substantial trailer, the seating capacity of the two cars being 72 persons. On the occasion of a big Republican rally in Los Angeles during the recent political campaign, the two cars hauled 153 passengers on one trip. Fig. 5 shows a combination mail coach recently put in service under contract with the Government. It is 42 ft. 5 in. long with 16-ft. mail compartment, and is equipped with two 50 h.p. Westinghouse motors, air brakes, interior arc lights, and arc headlight. Its seating capacity is 32 persons. 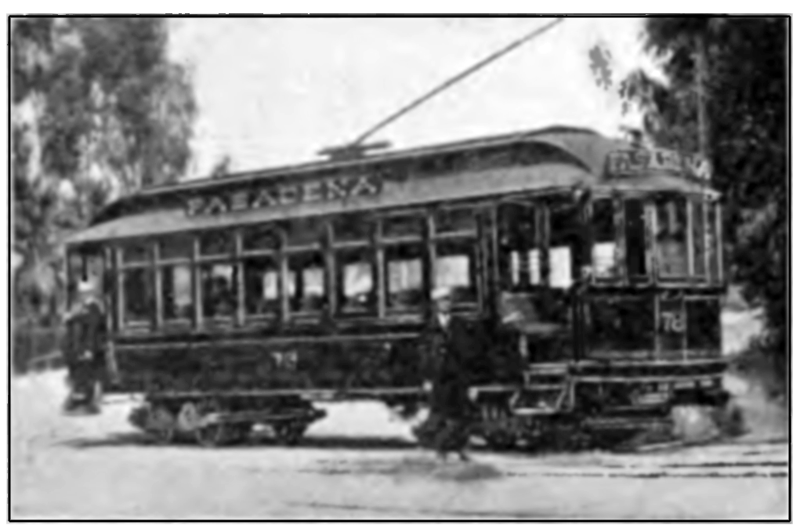 The car makes three round trips daily between Los Angeles and Altadena. Fig. 6 is a standard "dinkey" used in local service in Pasadena. It is equipped with two 25 h.p. Westinghouse motors and arc headlights. Fig. 7 illustrates the company's wrecking car, which is equipped with two 40 h.p. Westinghouse motors, and will pull a 15-ton car up a 7 per cent grade. So easily does it handle the heaviest cars on the road, the wrecking crew have hung up a sign in one end reading, "All cars look alike to me." 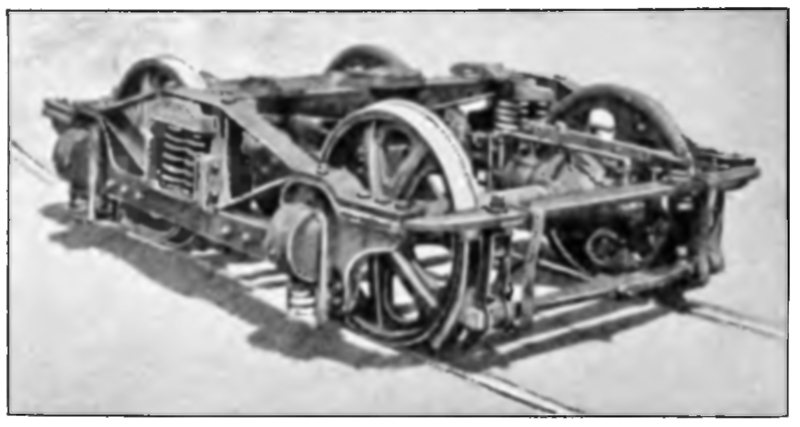 The wrecker is provided with several appliances for the quick handling of wrecks of all kinds, one of these being a four-wheel "dolly" truck used in cases of broken axles and wheels. The "dolly" is run under the car in trouble, the truck is chained to the body, and the car hauled to the barn by the wrecker, with "dolly" acting as one truck. Fig. 8 is the company's standard truck, which it builds at its own shops. FIG. 9-SCENES ON THE MT. LOWE DIVISION. In Fig. 9 are shown different views of the Mt. Lowe division from Altadena to Alpine Tavern. "All of our cars except the three used for hauling trailers are upholstered in plush and are cleaned throughout once a week with compressed air. Owing to the fact that our cars lie over half an hour after each round trip at the Pasadena terminal, we are enabled to keep them swept and the windows very clean at a slight cost. We never use water on the windows or car bodies, but use for window cleaning 'Bon-ami' soap, and one man can clean the windows of one car perfectly in 20 minutes. For car bodies we use a liquid car cleaner, which we find has increased the life of the varnish six months and keeps the surface of the body always looking bright. Granite Gate, "Ye Alpine Tavern," and View between Echo and Alpine. The aisles of all cars are carpeted, we having found after a great deal of experimenting that carpet wears the longest and is quite an attraction to passengers, and has the moral effect of assisting us to keep the cars cleaner, as we find that passengers of all classes will invariably scrape their feet before entering the car, and it is very seldom that cars are littered up with peanut shells, etc. We are also very strict regarding the rules posted in both ends of cars prohibiting the spitting on the floor, and the carpet has its effect in preventing that disgusting practice."